"Nippon Rock'n'Roll" documents the rise of Masaaki Hirao. Dubbed "The Japanese Elvis", he was one of the famed Rokabirii Sannin Otoko (Three Rockabillies), alongside singers Mickey Curtis and "Kei-chan", Keijiro Yamashita. 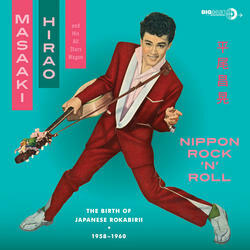 In early 1958, the rokabirii buumu (rockabilly boom) was born, the first youth music tribe in the Land Of The Rising Sun. Rokabirii may resemble US rockabilly, but the Nipponese variation is a more diverse dish. Hirao and his band's covers of Eddie Cochran, Elvis Presley and Little Richard are not kitsch renditions, but raw, desperate rockers.